Classic-Castle.com • View topic - LOTR beasts: molded or brick-built? LOTR beasts: molded or brick-built? Not sure if this is in the right place, so moderator please move if need be. So, anyway, hopefully LEGO will be including some of the cool beasts from LOTR and TH in future sets, such as the Fell Beasts of the Nazgul, the Balrog from the Mines of Moria, the eagles, the wargs, Smaug, and so on. Maybe even the Great Goblin will exceed minifig proportions. Now, my first impulse was to hope all these would be brick-built 'cause that is what LEGO is all about, right? However, I am switching to hoping they are mold-based. Why? LEGO's move from brick built horses to molded horses years ago kind of sums up my attitude. Other examples: the elephant from the Orient line and dinosaurs from the Dino line. I think LEGO could do something similar with the fell beast and balrog. Same with wargs being done similar to horse molds (and new poseable bear). The eagles might be an exception, though, like the molded chicken--I much prefer brick-built chickens! What do others think: would you rather see molded or brick-built LOTR and TH beasts? Re: LOTR beasts: molded or brick-built? Those brick built ones should employ some sort of ball/socket method, except for the eagles. Speculation threads belong in the Dear LEGO forum. I will move this thread there. Brick built monsters are great for larger scale creatures because you can't really get the detail you want in a small animal. Not always the case though, because sometimes you don't need that detail (like how people have build mini-fig scale sheep). No offense, but I really hate the dragons from the Castle (2007) line because it was like...5 pieces in total. That would really stink if it happened to LOTR sets. I think we can get something more like the Vikings dragons, or the creator type dragons, etc. and have a better result. I agree with Forestboy; I think it's all about scale. In my opinion the molded chickens are about 30 years overdue, but I still have a fondness for brick-built horses. I imagine that this is a huge perennial question when Lego designs sets. If the forum ever has the opportunity for a discussion session with any TLG designers, I'd love to ask them about the internal thought processes for making such decisions. Wargs and Goblin King are going to be molded, for those of you who haven't seen the pics yet. AK_Brickster wrote: Wargs and Goblin King are going to be molded, for those of you who haven't seen the pics yet. 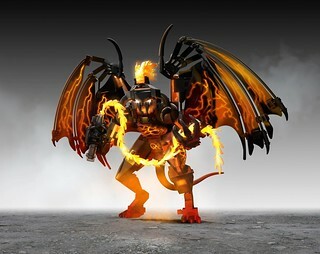 Would Lego actually connect the fire pieces like that? is that "Legal"? Location: "Where the wind comes sweeping down the plains!" Apart from size, I make a distinction between "normal" or domestic animals and monsters. The latter can look fantastic when brick-built, but the former are apt to look rather robotic. Molded animals can have more subtle curvature to their bodies, as well as printed faces and markings. It makes them look cozier and more like animals that you can imagine minifigs interacting with on a daily basis. Medieval Guy wrote: Would Lego actually connect the fire pieces like that? is that "Legal"? Do you know someone with the "rights" to that technique and this isn´t the first time TLG has borrowed something from the FOL-community. One can think as it as a tribute, I would. Karalora wrote: Apart from size, I make a distinction between "normal" or domestic animals and monsters. The latter can look fantastic when brick-built, but the former are apt to look rather robotic. Molded animals can have more subtle curvature to their bodies, as well as printed faces and markings. It makes them look cozier and more like animals that you can imagine minifigs interacting with on a daily basis. I agree on this, the animals that have been brick-built are rather small (like ducks, chickens) so they look also blocky, without detail. So they are better molded and they fit better in then with the minifigs. mencot wrote: Do you know someone with the "rights" to that technique and this isn´t the first time TLG has borrowed something from the FOL-community. One can think as it as a tribute, I would. Isn't he just asking whether it's possible for those pieces to connect like that? i.e. a legal connection, not whether they've used 'someone elses' technique? I'd be surprised if someone hasn't had a crack at building it based on the available images. oh okey one can use the word "legal" like that also I though it was strange that he would ask a thing like that. Sorry, I should have explained what I meant. I know that it is possible to connect the pieces in that way, but there are some techniques that Lego will not allow their designers to use. There is a really good pdf that I can't link to, just google "illegal building techniques".